This month, the topic is Asymmetry. Feel free to design something asymmetric--the possibilities are practically endless! The asymmetry can be in the crease pattern (think Ryuzin, though entries need not be that complicated) or in the model itself. -The model must be designed specifically for this challenge. 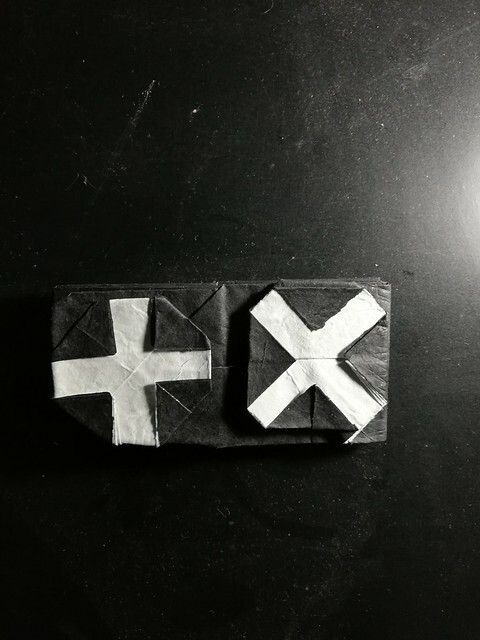 -Use one uncut square. Methylcellulose is allowed for shaping, if necessary. I'm hoping for at least a few entries this month. Let's see some of you branch out a little. Looks like a regular cylinder but this cone is smaller at the top and leans. Yep - it is a "Wonky Cone"
The diagram at the right is a starting point - you need to fold over some corners to make the edge look smooth. Excellent first entry. I love that at a glance it doesn't look any different to a normal cylinder. 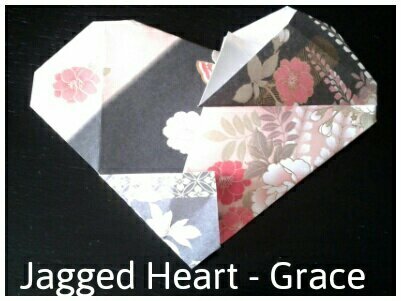 I have just finished teaching a Valentines themed class and hearts are on my mind. 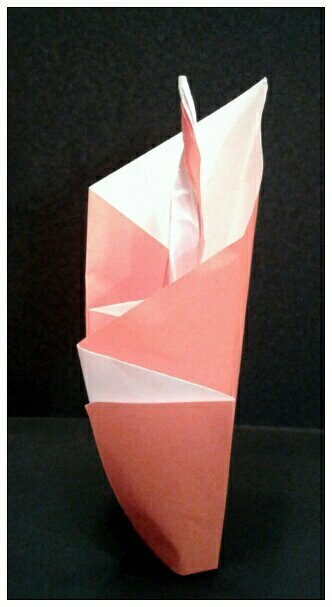 Here is my entry: The Jagged Heart. The backside is a lateral inversion of the front side. 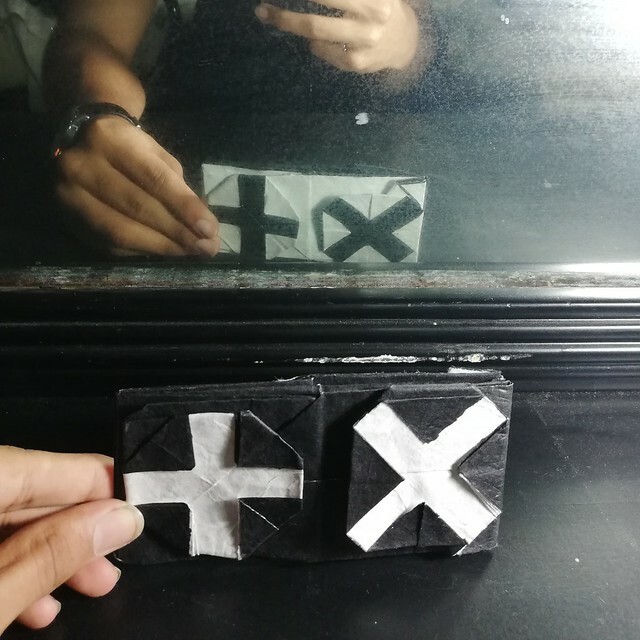 It means that if I look at it in front of the mirror, the reflection would also be the same +x symbol but in the complementary color. The asymmetry can also be seen in the crease pattern, which may look symmetric at first but it has all it's creases inverted on one side. This gives the model it's complementary color and lateral inversion. 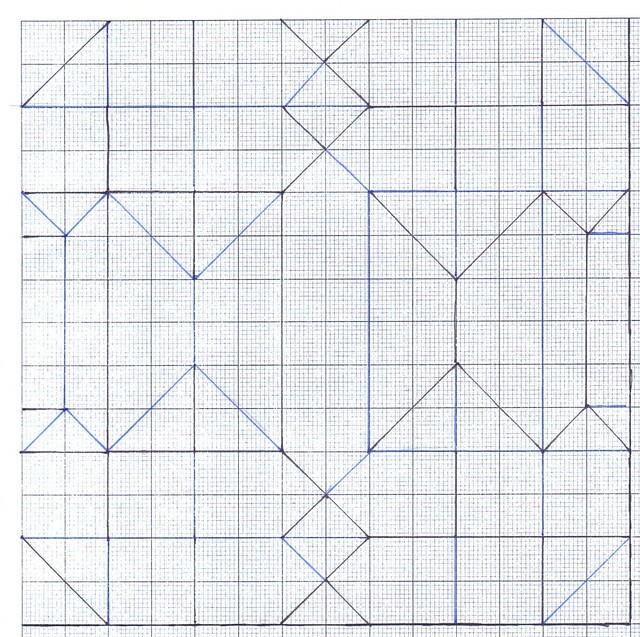 It's based on a unique 7 x 7 grid. Why slug? Because they are impossible to mis-shape. Amorphous little life savers. I was aiming for a lady bug (or maybe even cooler, a spider) and two more leafs, but it turns out they are very much possible to mess up at shaping. I’m satisfied with backup plan. You? Give me some feedback please. That is a very impressive model. It looks great, but are you sure that slug isn't a snail? It looks like a snail to me. Is that puffy thing a shell or not? Also, great name for it. Folderp wrote: , but are you sure that slug isn't a snail? No, i'm not sure at all. You appear to be right. Good eye, my friend. Also thanks for the nice feedback. 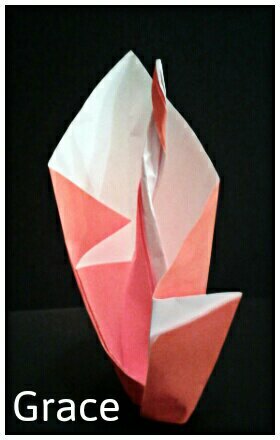 Origami fire lily. I like how different it looks side to side. 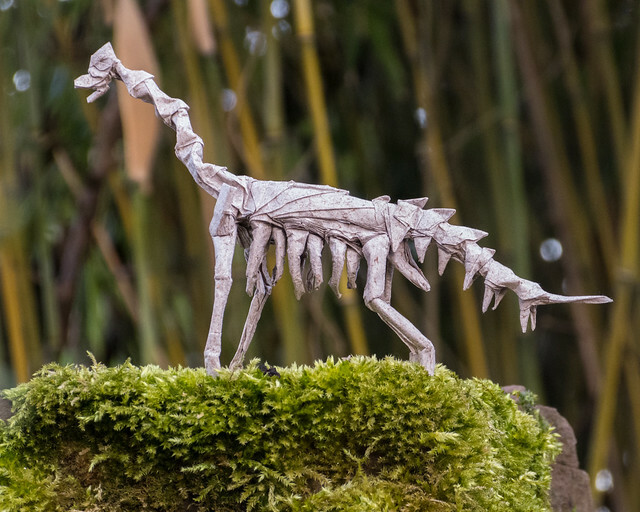 its an asymmetric CP, but the finished model is symmetrical.I planned to publish the CP in a convention book, but i can tell you that its basic structure is similar to my Pteranodon Skeleton. 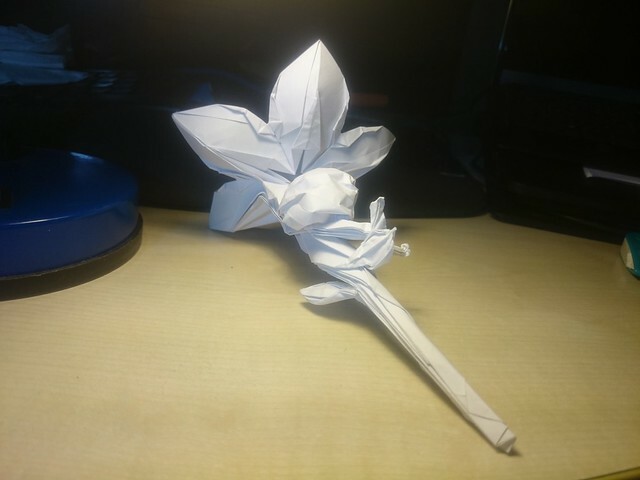 https://twitter.com/bodo_ori/status/1095051995998814210 ( the base folded in orihime ) you can kind of see the asymmetry in there, but trust me, the CP is very asymmertic. Your dinosaur skeleton is amazing. 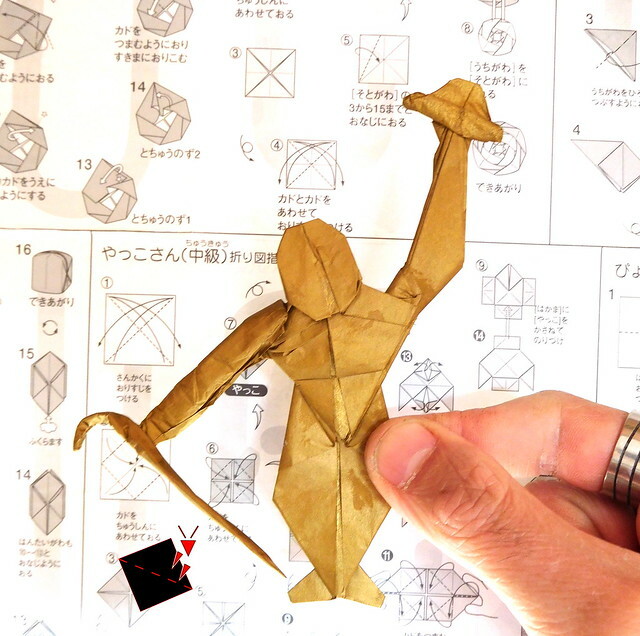 Are you submitting it to the British Origami Society convention book? This is an asymmetrical (but only slightly) dwarf that I designed. 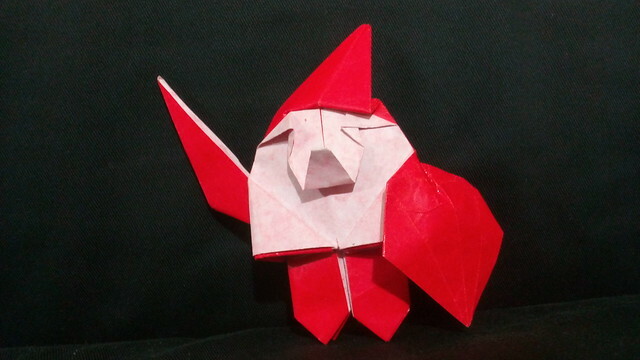 It came about as a result of me trying to make, well, a guy with a sword and shield actually. Which is good. Normally I fold around a bit until I get an idea to do something with a base, instead of deciding on something to do and then folding it. From a frog base. 25cm square. 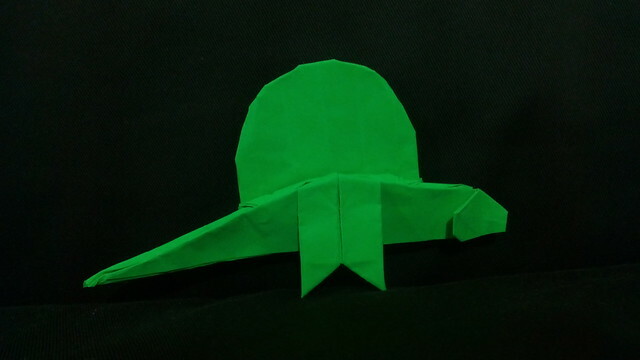 This is a simple dimetrodon I designed. The spine thingy is from one corner of the square and the legs (only two of them) are from the opposite corner. The legs are formed the same way as those of my Diplodocus. NeverCeaseToCrease, sorry to bother you with multiple entries again, but I am once again unsure which I prefer. 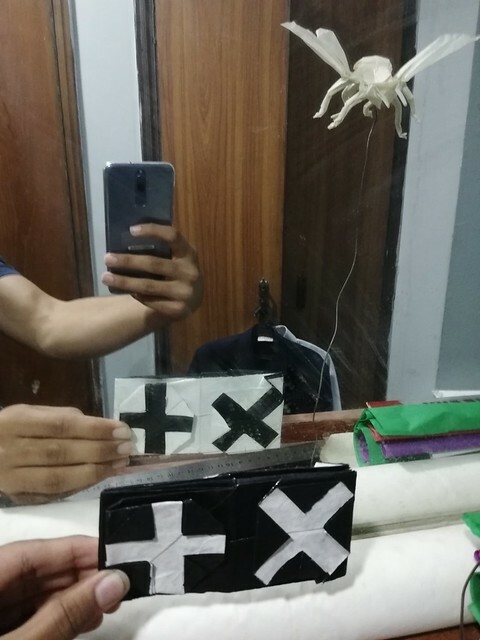 but it's from a triangle (half square) does it count ?